The Chandaria family—emigrants from the Indian-enclave of Nairobi—have managed to flourish in America. Premchand, the father, is a doctor who has worked doggedly to grow his practice and give his family security; his wife, Urmila, runs a business importing artisanal Kenyan crafts; and their son, Sunil, after quitting the pre-med track, has gotten accepted to a PhD program in philosophy at Harvard. But the parents have kept a very important secret from Sunil: his cousin, Bimal, is actually his older brother. And when this previously hidden history is revealed by an unforeseen accident, and the entire family is forced to return to Nairobi, Sunil reveals his own well-kept, explosive secret: his Jewish-American girlfriend, who has accompanied him to Kenya, is, in fact, already his wife. Spanning four generations and three continents, The Limits of the World illuminates the vast mosaic of cultural divisions and ethical considerations that shape the ways in which we judge one another’s actions. A dazzling debut novel—written with rare empathy and insight—it is a powerful depiction of how we prevent ourselves, unwittingly and otherwise, from understanding the people we are closest to. Evocative and profound… an intimate novel about family that is, at the same time, an illumination of miscommunication across cultures, an exploration of the legacy of migration in both Africa and the US, and a philosophical rumination on ethical behaviors. Jennifer Acker’s is a wise and honest literary voice. The Limits of the World is a riveting and nuanced study of how we belong—to a lover, a family, a country. The prose is beautiful, the story is refreshingly original, and the characters are achingly human. The novel announces Acker as a writer of deep feeling and intelligence, a formidable writer whose talent is limitless. The world of the 21st century is transnational, connected, and small, and the only remaining borders we have left are of our own design. From the Harvard Halls of Boston to the grassy plains of Nairobi, this unabashedly intelligent and beautiful book of generational conflict, culture clashes, and immigrant assimilation reminds us the limits of this world depend entirely on the sizes our hearts, our capacity to love ourselves and each other. The Limits of the World travels vast distances, not only from India to Kenya to the United States, but also from grandfather to mother to son. A gorgeously written, bravely honest novel about moral philosophy and love: the difficult kind, the beautiful kind, and every other kind in between. Acker’s debut is a carefully drawn portrait of a family constrained by choices… a rare but honest look at the way parents, children, and spouses talk to one another but don’t always hear what’s being said. A thoughtful, deeply researched debut. 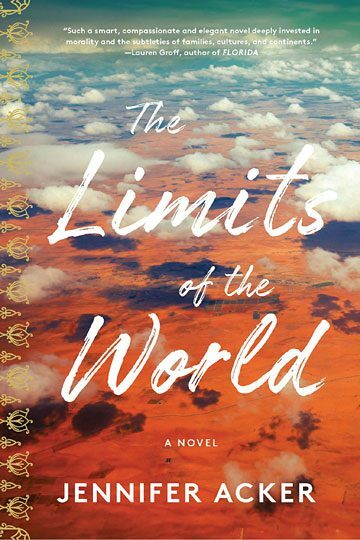 The Limits of the World is such a smart, compassionate and elegant novel, so deeply invested in morality and the subtleties of families, cultures, and continents, that it feels delicious and exciting to recall that this is Jennifer Acker’s debut. The Limits of the World is the most masterful debut novel I have read in years. It’s a rivetingly written evocation of the world of East African Indians, who are at home everywhere and nowhere. It shows the complicated ways in which family splits and regathers, across continents and cultures, across time and space. Along the way, in beautiful, understated prose, it empathetically explores the misunderstandings between cultures: Indian, African, American. The book also demonstrates that a truly gifted writer like Jennifer Acker can inhabit lives of any color, any gender, and make us care about them as if they were our own. In this wise, loving book I saw my mother’s family, exiled from Nairobi; I saw me. Jennifer Acker is founder and editor in chief of The Common. Her short stories, essays, translations, translations, and reviews have appeared in the Washington Post , Literary Hub , n+1, Guernica, The Yale Review, and Ploughshares, among other places. 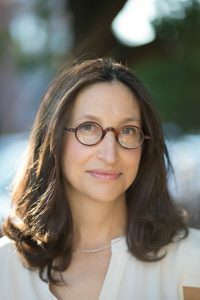 Acker has an MFA from the Bennington Writing Seminars and teaches writing and editing at Amherst College, where she directs the Literary Publishing Internship and organizes LitFest. She lives in western Massachusetts with her husband. The Limits of the World is her debut novel.